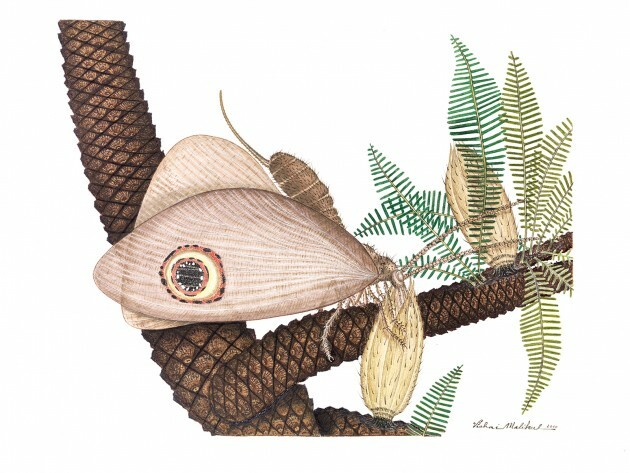 In an incredible example of convergent evolution, both butterflies and kalligrammatids evolved the same physical characteristics at vastly different times and while feeding on disparate plant hosts, explains Conrad Labandeira, paleobiologist at the Smithsonian’s National Museum of Natural History. Kalligrammatids had an intricate feeding and pollinating relationship with non-flowering gymnosperms during the mid-Mesozoic; butterflies, by contrast, feed on and pollinate flowering angiosperms. Yet both major groups of seed-plants placed similar selective pressures on the two, unrelated pollinator lineages causing them to develop the same suite of physical and behavioral features. Labandeira is lead author of a Feb. 3 paper on this discovery in the journal Proceedings of the Royal Society: B. “Kalligrammatid lacewings are an extinct, Eurasian insect group that has been known to science for a century, but early fossils were fragmentary and not much could be learned from them,” Labandeira explains. New, well-preserved kalligrammatid fossils found between 2004 and 2012 in Middle Jurassic and Early Cretaceous lake deposits of Northeastern China revealed the features of this butterfly look-alike. Finely deposited lake sediments preserved the insects to a remarkable degree. During their study, the scientists were able to closely examine the fossil surfaces using light microscopy, scanning electron microscopy, electron dispersion microscopy and time-of-flight–secondary ion mass spectrometry to try and characterize molecules left behind by different parts of the insect’s bodies. “If you look at a modern butterfly wing at very high magnification, the colors that you see are actually determined by very small scales that are pigmented differently,” Labandeira says. 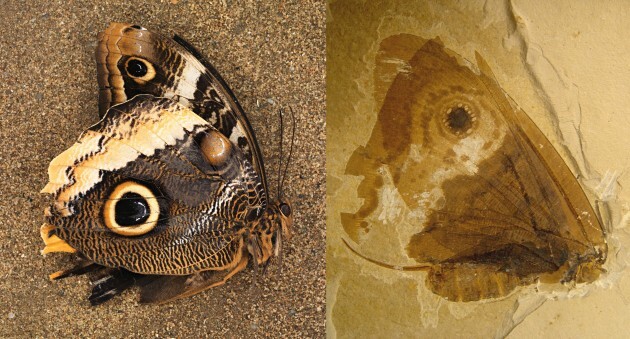 “It looks like kalligrammatids had these same type of wing scales.” The fossils also clearly show a variety of spot and eyespot patterns—concentric circles of pigmented cells that surround a central melanin-containing disc—that produce a conspicuous display on kalligrammatid wings, This is another convergent feature shared with butterflies. Kalligrammatid mouthparts—resembling a long flexible, straw-like proboscis—evolved from the chewing mandibles of their ancestors, the different parts of which were conjoined to form a long tube. This parallels the evolution of the proboscis from maxillary head segment in butterflies, both groups of which also originated from mandible bearing ancestors, the scientists write. Suction forces were provided by one, perhaps two, sucking pumps located in the frontal head region, mirroring those in butterflies. In one fossil the scientists were able to examine elements contained in an opaque piece of “gunk” found stuck inside the food tube of a kalligrammatid proboscis. The enriched carbon reading of the mass was consistent with a nectar-like fluid. Elemental analysis was also able to determine the likely presence of the substance melanin in kalligrammatid wing eyespots. Melanin is a common pigment in butterfly eyespots. Pollen grains found on and next to the bodies of several kalligrammatid fossils indicate a similar feeding style with butterflies—one that promotes pollination through use of pollen and nectar as a food reward.